Get the clarity, definition and sharpness of 3MP surveillance in one complete package. Start with Q-See’s excellent QT848 NVR with a 2TB hard drive already installed. Connect the eight included 3MP cameras with plug-and-play simplicity thanks to the built-in Power Over Ethernet (POE) ports on the back. Get everything up and running with the three simple steps of Scan N’ View which will have you remotely viewing and controlling your system from your tablet or smart phone in mere minutes. Q-See even includes an HDMI cable for free so that you can plug into a high definition TV or monitor to see 3MP video in all of its crystal-clear glory. 3MP recording technology captures a more detailed, clearer, digital image that provides a more accurate image with 50% more pixels than found in 1080p. Q-See start-up wizard advances through the setup process step-by-step making complete protection quicker than ever. Real-time recording accommodates up to 30 frames per second on each of the 8 channels in order to produce smooth, continuous and uninterrupted video that reveals details not visible to the naked eye. This NVR remote monitoring capabilities keep you connected, enabling you to better manage your small business from anywhere at any time. Simply download the free Q-See Apps and access live or previously recorded video via iPhone, iPad, Android, or Windows Phone. Instantly receive email alerts with incident snapshots when motion is detected or in the event a camera becomes disabled. Most outdoor cameras, and many indoor cameras, have infrared sensors that enable the cameras to record images in the dark. When the available light becomes too low for the camera to produce color images, LEDs come on that allow the camera to produce black and white images. The light from these LEDs cannot be seen, but they have a reddish glow that can be seen by someone looking at the cameras. 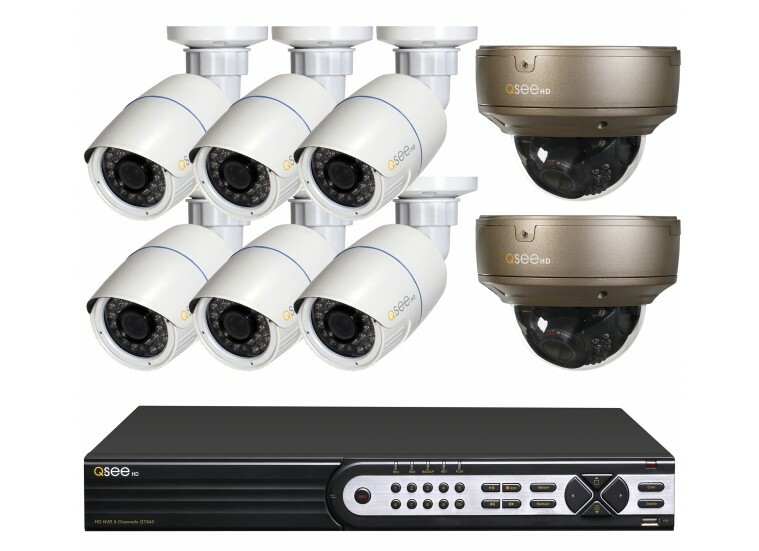 Equipped with state-of-the-art features, the Q-See QT848 NVR offers a wide array of essentials for managing your small business or protecting your home and family. Whether you want to deter theft, document a delivery, corroborate an incident, or just check on your family, this NVR is built to protect what is most important.